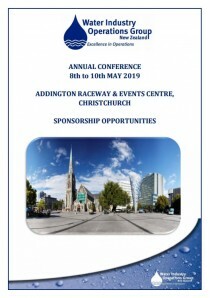 For the 2019 Conference we invite supporters and sponsors to complete the 'Registration of Sponsorship Interest' form below. All sponsors will need to register their details with us using this form. Once we have confirmed a sponsorship we will update the availability. Registrations of Interest for sponsorships will be confirmed by 1 October. Please note that some sponsorship categories now include registrations for one or two staff. Some sponsorships also include attendance at the Meet the Suppliers dinner and the Conference Awards dinner. Other categories will require staff attending to register and pay for dinners attended. Please take care in choosing the sponsorship package that suits your needs. Click here to see all the sponsorship packages. To register your interest for sponsorship, fill in the form below. I understand that this application is subject to confirmation of acceptance by WIOG. We will be in touch with you shortly. Will this person be attending the following? Do you wish to provide a challenge for the Operator Competition? If you would like more information on what this involves, please contact WIOG Committee member Bruce Nesbitt who will be coordinating the Competitions.